The model CPG1500 precision digital pressure gauge takes the concept of an analogue gauge, and raises it to a level only matched by digital calibrators. 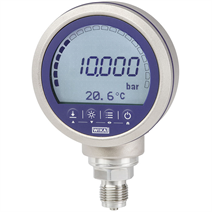 The accuracy of digital measurement technology and the simplicity of an analogue gauge are combined together to create the digital pressure gauge CPG1500, which in terms of performance, ease-of-use, and instrument features, is unmatched in the pressure measurement market. The CPG1500 offers an accuracy of 0.1 % FS (optional 0.05 % FS or 0.025 % FS) and is temperature-compensated in the range of -10 … +50 °C (14 ... 122 °F). Readings can be displayed in one of 26 pressure and 5 level units or also in customer-specific units, so that intricate conversions are avoided. The measuring rate can be user-defined to match the type of measurement required. Standard applications usually use three measured values per second. If required, this rate can also be set to 50 measured values per second. Via an energy-saving function, the CPG1500 switches automatically into “sleep” mode, in this mode the battery life can be increased up to 2,500 hours. Through the new and innovative menu navigation, simple operation is ensured. The clear display, with integral bar graph display and large text area, assists with the effective analysis of the widest variety of measuring points. With the MIN/MAX function, the highest and lowest pressures can be accessed immediately and saved automatically.